I am writing to invite you to a special meeting to be held before the Society of Mississippi Archivists conference this year, to discuss the current state of records of enslaved persons in Mississippi and elsewhere in the Deep South. – What have we got? – What kind of shape is it in? – How accessible is it (digitized, transcribed, indexed, etc)? – How can we collaborate to improve discoverability and access? The Society of Mississippi Archivists conference will be held at Mississippi State from April 24-26. The special meeting would be held on the afternoon of the 24th, starting at 3 PM. Please let me know if you would be able to attend by MARCH 22, 2019. NB: Please feel free to share this message with interested colleagues, including graduate students, in your state! I also invite all of you to seriously consider submitting a presentation or poster to the SMA conference. The call for papers is below, and submissions are due by FEBRUARY 7 (deadline has been extended). If you have any questions about the pre-meeting, please do let me know at jmcgillan@library.msstate.edu. The Society of Mississippi Archivists is pleased to announce their annual meeting will occur on April 24-26, 2019 on the campus of Mississippi State University, Starkville, MS. This one and one half day multidisciplinary conference will explore the theme of Diversity and Inclusion in the Archives. There will also be a pre-conference workshop on Wednesday, April 24, on Teaching with Primary Sources, Special Collections, MSU Libraries, from 2-5 PM. We seek posters, individual presentations and panels that consider all aspects of diversity and inclusion in archival practice, including reference, instruction, outreach, appraisal and processing. Please send an abstract (with title) of approximately 200 words and a brief bio to DeeDee Baldwin (dbaldwin@library.msstate.edu), by February 7, 2019. Both individual presentations and panel discussions will be limited to one hour sessions. We welcome proposals from scholars at all stages of their careers. Grocery Stories: Stories Behind the Counter of the Mississippi Delta Chinese Grocery Stores, a new exhibit at the Columbus-Lowndes Public Library in Columbus, Mississippi, will be on display from August 1-25, 2018. A presentation by Dr. Sherman Hong will take place at the library on August 14 at noon. Grocery stores played an integral role in the establishment of the Chinese presence in the Mississippi Delta. This exhibit focuses on the lives lived within grocery stores and demonstrate how many families blended their heritage with their new environment. The exhibit and presentation are free and open to the public and will take place at the Columbus-Lowndes Public Library at 314 North Seventh Street, Columbus, Mississippi. The exhibit is made possible by a grant from the Mississippi Humanities Council, through support from the National Endowment for the Humanities. The event is sponsored by the Columbus-Lowndes Public Library, Friends of the Columbus-Lowndes Public library, and Delta State University. For more information, call 662.329.5300. Registration for the 2018 Southern Archivists Conference in Montgomery, Alabama, on September 12-14 is now open. The program is an exciting one, with presentations, panels, tours of archival facilities, and a reception on Thursday night. You can register for the conference here. The Southern Archivists Conference is a joint biennial conference of the Society of Alabama Archivists, The Louisiana Archives and Manuscripts Association, The Society of Mississippi Archivists, and the Society of Tennessee Archivists. This year will mark 30 years of conference collaboration between these state organizations. INDIVIDUAL PRESENTATIONS of less than 20 minutes. May include any media supported by hardware and software available in the meeting rooms. PANEL PRESENTATIONS should be no longer than 60 minutes. They should consist of a chair/moderator and may operate as a discussion or a traditional panel. Please make your proposal in only one category. Proposals should contain complete contact information, presentation title, and abstract. Panel proposals should include contact/title/abstract for all participants. Please note what kind of presentation media you will need (PowerPoint, web access, etc.). This year, the Society of Mississippi Archivists will collaborate with regional archival associations from Alabama, Louisiana, and Tennessee to host the Southern Archivists Conference. This year’s conference will be held in Montgomery, AL on September 13-14. More information will be released when it’s available. The Society of Mississippi Archivists had a booth at the Mississippi Library Association Annual Conference (October 17-20). SMA members talked to librarians from around the state about how the organization can help with their daily jobs. We signed up some new members and met others around the state that have archival materials in their collections. The Billups-Garth Archives at the Columbus-Lowndes Public Library has partnered with the Mississippi Digital Library (MDL) to digitize seventy-nine letters written by Eugenia “Genie” R. Morgan from 1889 to 1890. The letters offer a glimpse into local life during the late Victorian Era and touch on topics such as social activity, romance, family dynamics, religion, friendship, health, and more. Genie was born in 1873 in Columbus to John D. and Mary Couch Morgan. Her paternal Aunt, Eugenia Morgan Moore owned Camellia Place. Genie attended Judson College in Marion, Alabama, but became sick in 1889 and returned home to recover. It was during this time of recovery that Genie’s letters were written. 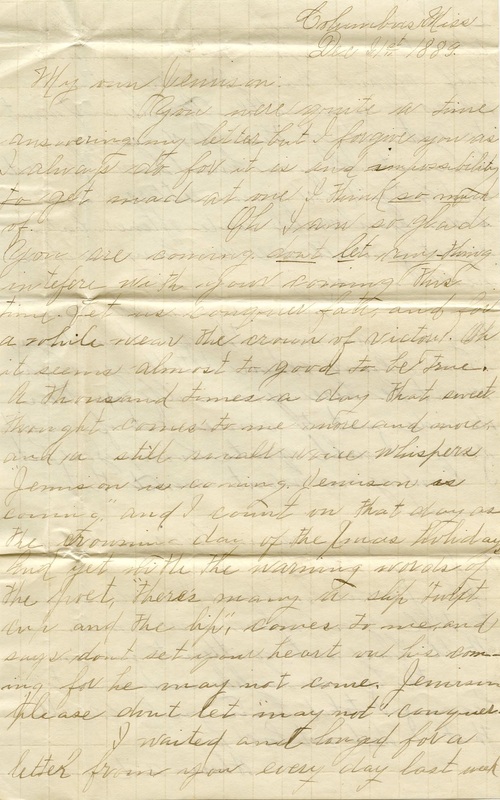 The bulk of the letters are to her second cousin, William Jemison Prowell, Jr. of Birmingham, Alabama with whom she had a romantic relationship. The relationship was complicated by other suiters, however, including Charles Dashiell and William Coleman. Genie mentions local dances called “Germans” as well as attending revivals in Aberdeen led by prominent Methodist preacher Samuel Porter Jones. At one point, Genie writes from Asheville, North Carolina where she assists her father in his recovery from an illness. Later, she returns to Judson College where she writes about events, students, and teachers. Genie Morgan died on December 30, 1894 when she was 21 years old and is buried in Friendship Cemetery. The letters along with their transcriptions are accessible on the MDL at http://www.msdiglib.org/about/partners/columbus. The MDL is hosted by the University of Southern Mississippi and provides a free online space to search and explore the wealth of materials available in Mississippi. For more information contact Mona Vance-Ali at 662-329-5304. 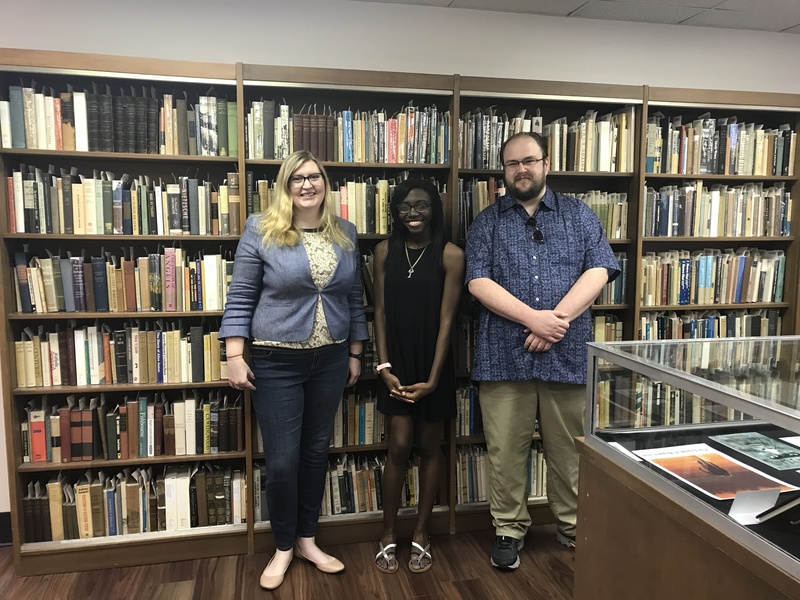 Special Collections at the University of Southern Mississippi hosted an exhibit opening April 25 in McCain Library room 305 to highlight three exhibits curated by Southern Miss students. Two years ago, Special Collections created an exhibits program that allows students the opportunity to curate mini-exhibits, featuring materials from the library’s collections. Students learn how to select items for display, install the materials, write label and exhibit text, and how to publicize the exhibit. This year’s exhibits feature the work of two undergraduate history majors and an English doctoral student. To learn more about the exhibits, go to the exhibit publicity page. If you have questions about the program or the exhibits on display, contact Jennifer Brannock at Jennifer.Brannock@usm.edu or 601.266.4347. University Libraries’ Special Collections at The University of Southern Mississippi is continuing its celebration of Mississippi’s Bicentennial with two summer lectures that will examine Mississippi’s film industry and Mississippi as a landscape for literature. The summer series will begin June 7 with Nina Parikh, Deputy Director of the Mississippi Film Office and conclude on July 12 with Margaret McMullan, an award-winning author and Mississippi native. In her lecture, “Film Mississippi: 1914-2017,” Parikh will discuss the state’s cinematic history as well as its future in the film industry. Scheduled to coincide with the Festival South Film Expo Festival (FSFX), Parikh’s lecture will take place Wednesday, June 7 from 1 – 3 p.m. at the Little Building in downtown Hattiesburg. Mississippi’s film history is rich with stories inspired by Tennessee Williams, William Faulkner, Eudora Welty, John Grisham, and many more. Mississippi is also the birth place of some of the most recognizable names in the industry, such as Morgan Freeman, James Earl Jones, Parker Posey, Gerald McRaney,, Jim Henson, Elvis, and Oprah Winfrey. Mississippi is also the location of a number of notable films that include A Time to Kill, The Help, O, Brother Where Art Thou?, and My Dog Skip. McMullan, the author of seven award-winning novels, will present “Mississippi as Landscape” on July 12 at 6:30 p.m. at The Library of Hattiesburg. McMullan is the author of When Warhol Was Still Alive, In My Mother’s House, How I Found the Strong, When I Crossed No-Bob, and Cashay.In 2015, she and Phillip Lopate curated Every Father’s Daughter, an anthology of essays about fathers by great women writers such as Alice Munro, Ann Hood, and Jane Smiley. McMullan has been the recipient of various honors and award. She was the recipient of a NEA Fellowship in literature, a Fulbright at the University of Pécs in Pécs, Hungary, and the National Author Winner of the 2011 Eugene and Marilyn Glick Indiana Authors Award. In 1007, she was the Eudora Welty Visiting Writer at Millsaps College in Jackson. She was the Melvin Peterson Endowed Chair in Literature and Creative Writing at the University of Evansville, where she taught for 25 years. She writes full time now in Pass Christian, Mississippi. This official bicentennial project was made possible by a grant from the Mississippi Humanities Council, through support from the Mississippi Development Authority. For additional information, contact Lorraine Stuart at Lorraine.Stuart@usm.edu or 601.266.4117.